I really like that the sink is so thick glass. I bought two several years ago and one got broke. I ordered this one to replace the broke one. It is pretty close but a shade darker green than my original. This gorgeous sink has finally been installed & used. 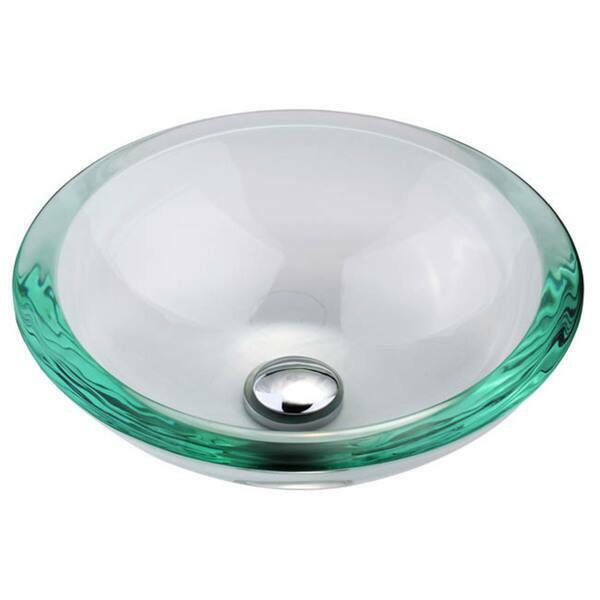 It's a substantial piece of glass that reflects beautifully; it's my eye candy for our renovated bathroom! The best part is that not only is it visually appealing, it is also very easy to maintain and clean. Thanks, Overstock & Kraus!! This was purchased for a luxury level basement finish in the bathroom. It works as good as any vessel sink but surprised at the compliments. People think the whole sink is as thick as the edge. As a designer I have used this sink many times. It has that "WOW' factor that everyone wants for such a small price! I love how thick the glass is and the green glass edge. It’s a beautiful large and heavy glass. These sinks are fantastic. So beautifully made and easy to clean. Love them. We installed two for our new Masterbath. Perfect. Purchased clear vessel to show off the sealed coin covered vanity top. Lots of complements for the striking thick sink. Put in my newly remodeled master bathroom, love the look and they are so pretty, will not disappoint.....I wipe with a cloth after each use and after 3 years they are still beautiful, price was very good. Nice, heavy, sturdy glass sink. very strong and nice clear color. "It says the maximum countertop thickness is 1.75'', but what if I buy a drain that is for a 3'' counter top? Does is really matter if I buy my own drain for thick countertops?" We stumbled upon this sink while contemplating many different vessel sinks for our bathroom remodeling project. I like how the glass is clear so the vanity won't be totally covered up, yet the thick edge of the glass provides a slight pop of color. "Is the edge on this bowl rounded or flat? Is it a clear - see thru- bowl?"